Because the dive watch is such a popular choice of tool watch, the Flieger, which is also a tool watch, could be overlooked as wrist wear that offers an alternate and very sleek style. The German’s developed the Flieger, which is German for pilot’s watch, in World War II for their pilots as an instrument for navigation in the cockpit. Five companies fulfilled the contract: Lange & Sohne, International Watch Company, Laco, Stowa and Wempe. Inspired by the Flieger, the new Fortis 701.10.81.K F-43 Flieger Chronograph limited edition watch uses a classic layout on a black dial. There were two types of dials that were acceptable to German specifications on the Flieger watch. 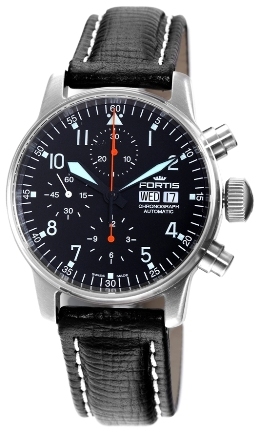 The Men’s 701.10.81.K F-43 Flieger Chronograph watch opts for the Type A (Baumuster A) used from 1940 to January 1941, an arrangement employing illuminated hands and white Arabic numerals with a triangle surrounded by dots representing 12 o’clock. The reason for the triangle instead of an Arabic numeral was to allow pilots to orient the watch in the correct position when night fell. The original German Flieger only required the time element without complications. The Fortis 701.10.81.K F-43 Flieger Chronograph is a modern interpretation, so it builds in more functionality to the watch. In addition to the clear view of the time, it has the added feature of a chronograph aesthetically placed with minutes, running seconds and hours respectively at 12 o’clock, 9 o’clock and 6 o’clock. It also provides the day and date opposite each other at 9 o’clock and 3 o’clock. 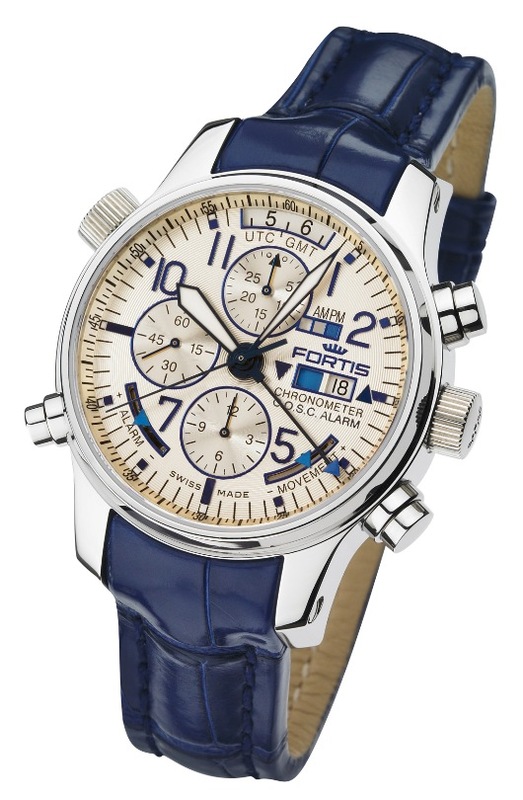 As an added bonus for car nuts, Fortis also inserted a tachymeter on the flange. In other words, the Fortis 701.10.81.K packs a punch of useful tasks in one package. 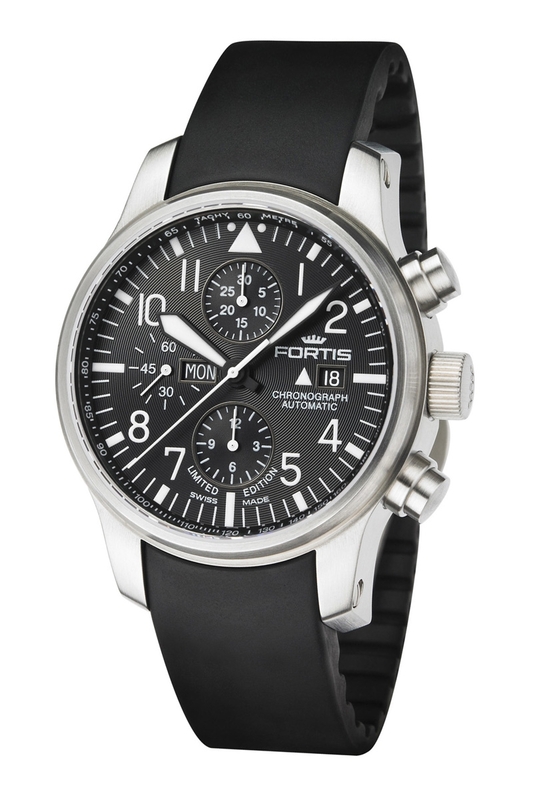 In a modern-sized 43 mm case composed of durable stainless steel with a nice grippy crown and chronograph pushers in the 2 and 4 o’clock position, the Fortis 701.10.81.K F-43 Flieger Chronograph Watch comes on a black rubber strap with a push button deployant clasp. Its automatic movement is on view through the sapphire crystal caseback. No worries with most water activities, as the watch is water resistant to 660 feet. 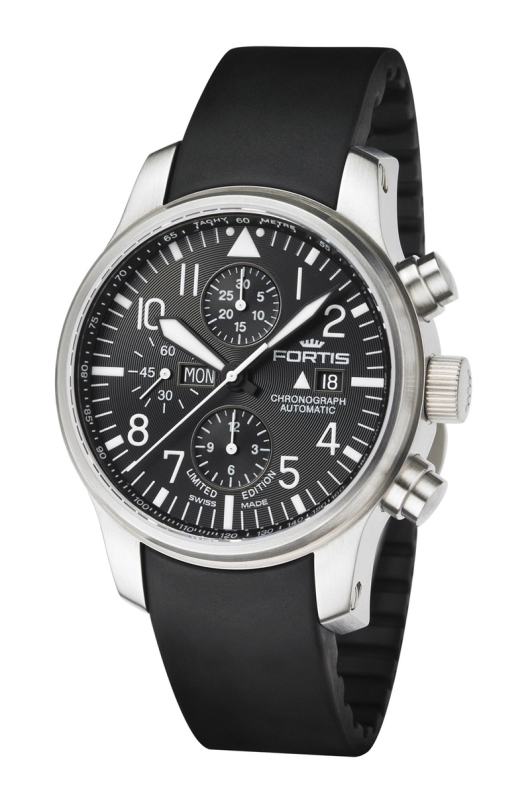 For a tool watch that stands a bit apart from the crowd and has just as much cool history, the Fortis 701.10.81.K F-43 Flieger Chronograph Watch is a fashionable and functional option. 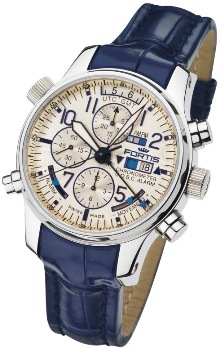 Purchased your Fortis watch from an authorized Fortis dealer. The Fortis F-43 isn’t just the world’s first mechanical GMT alarm chronometer with dual power reserve. 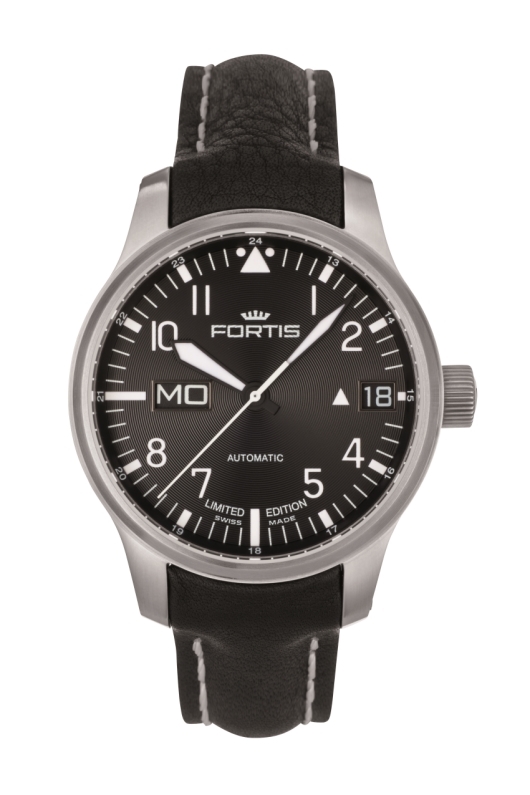 Fortis has a long history of innovation and technical achievement, but they’ve outdone themselves this time. The new Fortis Limited Edition F-43 is not only the world’s first mechanical GMT, alarm, chronometer with two separate power reserves, one for the movement and another for the alarm complication; it is the only one available anywhere. Moreover, this amazing dual-time alarm chronometer is fully certified by the Contrôle Officiel Suisse des Chronomètres, a formidable achievement in its own right. Few timepieces ever produced have been able to display the wealth of information provided by the F-43 in such a readable, easy-to-understand fashion. With a dedicated GMT window at 12 o’clock, a large triangle-tipped hand to indicate the alarm time, two separate power reserve indicators for the alarm and time functions, along with a date window with alarm “on-off” indication, this watch has it all. There is also a free-running small second hand at 9 o’clock; an AM/PM indicator at 1 o’clock, and 30-minute and 12-hour subdials for timing virtually any length event. The mechanical complexity of the F-43 is unprecedented. The watch is powered by a proprietary 39-jewel Fortis calibre F 2012 alarm GMT movement. There are two independent spring barrels to power the alarm and time functions, along with a premium Incabloc shock absorber. 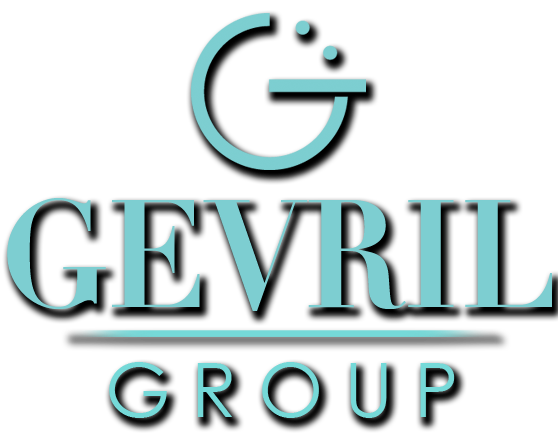 There are four convenient protected stainless steel pushers to control the time and alarm functions and scratch resistant sapphire crystals on both sides of the watch. The impressive 43mm two-piece stainless steel case is water resistant to 165 feet and has been fitted with a spectacular blue padded crocodile leather strap that matches the embossed blue numbers and indices on the silver opaline dial. Only 100 of these amazing timepieces will ever be produced. If you’re the type of person who appreciates mechanical perfection, you won’t want to miss this unique opportunity to acquire the world’s first and only mechanical GMT alarm chronometer. 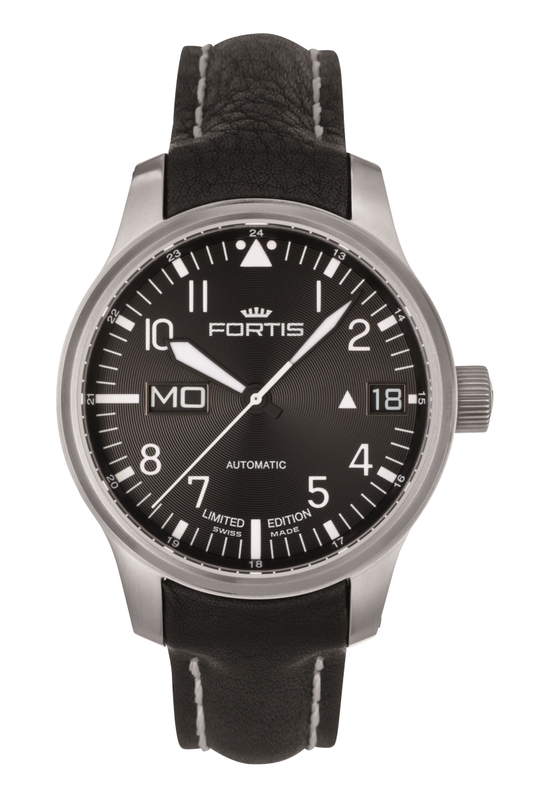 To put this mechanical marvel on your own wrist, contact an authorized Fortis dealer immediately and reserve your Fortis F-43 today.